One of the interesting things about studying the psalms is discovering that sometimes parts of them are drawn from other portions of the Old Testament, even from other psalms. Psalm 108 is made up of the endings of Psalms 57 and 60. In the earlier psalms David was writing under stress. According to the title of Psalm 57, David was hiding in a cave in order to escape from Saul, who was trying to kill him. 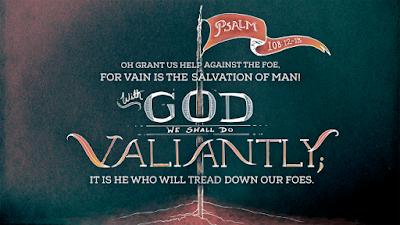 The title of Psalm 60 refers to a time of war between David’s armies and the Edomites. The earlier psalms each begin by describing the perils David faced, then they end on a positive note of praise and hope for the future. It is these two endings that are combined in Psalm 108 to produce what I have called “a warrior’s morning psalm.” In this psalm the king begins his day by praising God. He is awake even before the dawn, asking God for help in his battles and trusting that God will soon give him victory over his enemies, particularly those in the fortified cities of the secure mountain stronghold of Edom, which is where the psalm ends. The first thing the author has to say is that his “heart is steadfast,” or fixed. A few verses later we learn the secret of his stability. It is because God is a steadfast, or faithful, God, and the psalmist’s confidence is in him. Indeed, God is more than just steadfast. He is also a God whose love and faithfulness reach as high as the sky or heavens, which is a way of saying that they are infinite and thus beyond our full comprehension. your faithfulness reaches to the skies (vv. 3–4). It is because God is faithful that the psalmist can also be faithful. Are we faithful in this sense? Are our hearts steadfast? Since the writer’s confidence is in God, rather than in himself, we are not surprised to find the opening stanza of the psalm calling for God to be exalted: “Be exalted, O God, above the heavens, and let your glory be over all the earth” (v. 5). God is exalted above the heavens. His glory does fill the earth. The goal of history is that God might be known as God and be honored for it. Nothing will frustrate this worthy purpose of the Almighty. This verse is not a statement that God has or will be exalted. It is a prayer that he might be exalted, obviously in the king’s own circumstances. The world thrills when human beings are exalted, but those who know God rejoice when God is exalted, especially when they have the privilege of exalting him in circumstances that may be disappointing or hard. The second section of the psalm contains a prayer to God to save, help, and deliver those who have been attacked, probably by the Edomites (v. 6), followed by God’s answer in the form of an oracle (vv. 7–9). The oracle follows so closely upon the appeal that we know faith has already won a victory, just as in Psalm 60, from which these words are taken. It is because God has spoken that the writer can have hope for the future and pray confidently for God’s help and deliverance. Faith must always be grounded in the Word of God. and no longer go out with our armies? (v. 11). and he will trample down our enemies (v. 12). How can we take this psalm from its ancient setting and carry its value into our own time and beyond? There are two ways. 1. By gaining strength for our conflicts. You and I are not kings. We do not have military battles to fight. We have never seen an Edomite. However, we as Christians have spiritual battles. We are members of the kingdom of the Lord Jesus Christ, and our task is to advance his kingdom in this spiritually hostile world. The apostle Paul spoke of this battle in Ephesians, explaining that “our struggle is not against flesh and blood, but against the rulers, against the authorities, against the powers of this dark world and against the spiritual forces of evil in the heavenly realms” (Eph. 6:12). Compared to the conquest of these hostile spiritual forces, the victory over Edom and the overthrow of its mountain stronghold Petra was easy. How can we gain this greater victory? Not by ourselves, or even with the help of other Christians. 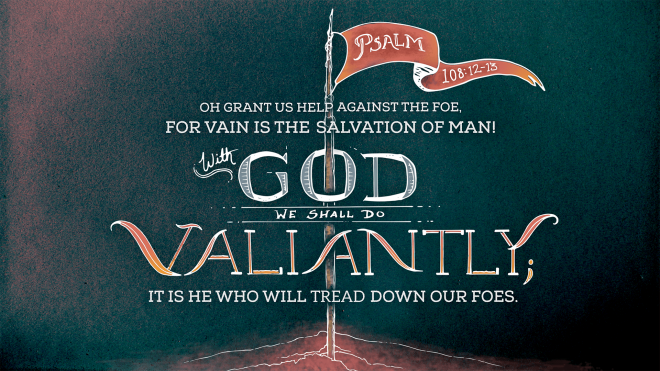 In this battle “the help of man is [truly] worthless.” We need God to fight with us and for us. Therefore, we need to ask God for help, as the psalmist does. James says, “You do not have, because you do not ask God” (James 4:2), and Jesus, expressing James’s words positively, said, “Ask and it will be given to you; seek and you will find; knock and the door will be opened to you” (Matt. 7:7). One thing we can ask for is victory for the gospel. Nebuchadnezzar’s vision, the one he could not remember but troubled him so much, was a vision of an enormous statue representing in sequence several of the powerful ancient kingdoms of this world: the kingdom of Babylon, those of the Medes and Persians and Greece, and finally the great empire of Rome. At the conclusion of the vision a rock “not cut by human hands” struck the statue and destroyed it and then grew up to become “a huge mountain” that “filled the whole earth” (Dan. 2:34–35). That rock is the Lord Jesus Christ, and the mountain is his kingdom, destined to triumph. If you are a Christian, you are part of that kingdom, and Christ’s kingdom is something you can labor and pray for confidently. and the year of my redemption has come” (Isa. 63:1–4). Who is this warrior? He is none other than the Lord Jesus Christ, returning to Jerusalem after having subdued the hostile peoples of this evil world. This is a vision of the end of time, a vision that takes us to the kind of descriptions we find in the very last book of the Bible, Revelation. Here we see the sure punishment of the wicked and the certain vindication of those who trust God and look to him for their deliverance. That day has not yet come. For the time being there are still hard times and defeats for God’s people. If the day of the vengeance of our God has not yet come, it is in order that God might show grace now to more people. In Peter’s day there were skeptics who were saying that because things seemed to continue as they have been from the beginning, there will not be a judgment. It will never come. “Where is this ‘coming’ he promised? Ever since our fathers died, everything goes on as it has since the beginning of creation,” they mocked (2 Peter 3:4). Peter answered, “The Lord is not slow in keeping his promise, as some understand slowness. He is patient with you, not wanting anyone to perish, but everyone to come to repentance” (2 Peter 3:9). God is delaying the ultimate working out of judgment until those whom he will call to faith in Jesus Christ come to him. Judgment is not yet; this is the day of God’s grace. But judgment will come. If you are not a believer in Jesus, God warns you to believe on Jesus now, while there is still time.